He was a 19-year-old Leatherneck fresh out of boot camp at Parris Island, S.C. who joined the Marine contingent on the battleship in Norfolk, Va. On its way to a shakedown cruise in the Caribbean after repairs at Norfolk Navy Yard, the 57,000 ton, 887 foot-long, Iowa Class leviathan got stuck in the mud in Chesapeake Bay ending the naval career of Capt. William D. Brown, a 30 year veteran who had commanded submarines and destroyers in World War II. 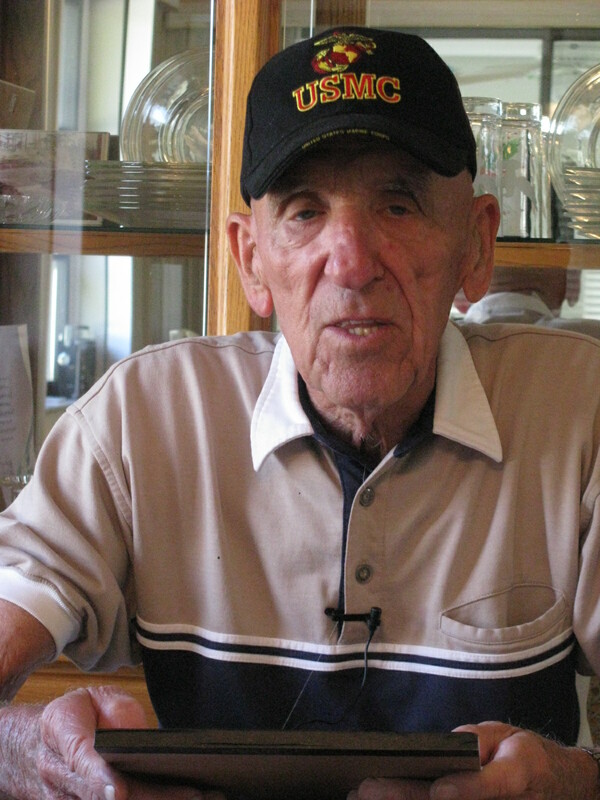 “I was coming back from chow in the morning when I felt the ship hit the mud bank and run aground,” the 83-year-old Jarhead explained. Executive Officer George Peckham got on the intercom and said, ‘We just ran aground, but we’ll be off in a matter of minutes.’ It wasn’t a ‘matter of minutes,’ we were on the mud bank for two weeks. “The first thing they tried was to get a couple of tug boats to pull us off. But that didn’t work,” Ditto said. “The Missouri wouldn’t budge. Brown was a 30 year veteran with an unblemished record commanding submarines and destroyers during World War II. He was charged with negligence in the Missouri mud bank debacle and he was relieved of his duties. “During the next couple of days we unloaded the battleship trying to lighten its load and reduce its draft. They brought in a couple more tug boats, but they couldn’t pull the Missouri free of the mud. “Then they thought they might be able to free up the ship by rocking it. They had the 2,500-man crew run back and forth from one side to the other. That didn’t work, nothing happened,” he said. “Army dredges were brought in. These dredges tried to free the Missouri by clearing the mud away from the ship’s hull. They also sent divers down to survey the situation, but the Missouri wouldn’t come free of the mud. “Finally they brought in eight or 10 big tug boats and the combined pulling power of these boats freed the Missouri that was trapped in the Chesapeake Bay mud bank for two weeks.” Ditto said. For a Marine sea duty aboard the battleship could mean a number of things. A Leatherneck might be employed on sentry duty in the ship’s brig. In port Marines were the ones who guarded the Missouri and during general quarters. When the battleship was under attack, Marines manned the 20 mm and 40 mm antiaircraft guns. Ditto’s immediate superior, the man in charge of the ‘grunts,’ the person he might come in contact with on a daily basis was 1st Sgt. Herbert J. Sweet. Sweet was a legend in his own time. He fought at Iwo Jima, Guadalcanal and Pelaleau during World War II. 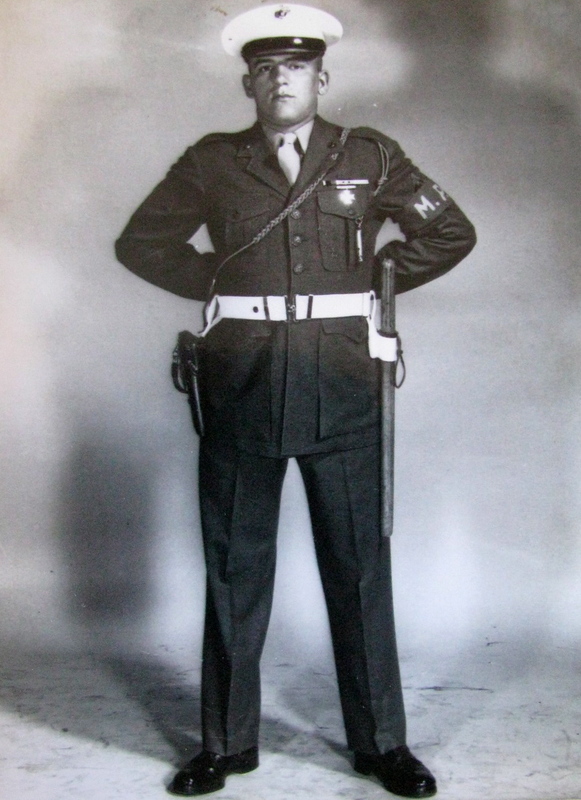 Sweet was the fourth ranking sergeant in the United States Marine Corps when he commanded Pfc. Ditto. He went on to become the highest ranking enlisted man in the Corps in the late 1950s. “Long after all of us were out of the service, Sgt. Sweet came to the annual reunions held by the Missouri’s Marine detachment. I forget the year he passed away, but I went to his funeral in Arlington. It was a big deal. “The Marine Corps Band was playing hymns as a contingent of Marines marched to Sgt. Sweet’s grave site. Tears came to your eyes because you know that man in the casket atop the caisson was a great man,” Ditto said decades later. “The Korean War started in June 1950 and the Missouri departed for Korea on Aug. 19, 1950. We sailed through the Panama Canal with only five-inches to spare on each side of the battleship. After reaching the Pacific we were hit by a typhoon that blew for three days. “On the fantail of the ship we had a helicopter strapped to the deck with cables,” he said. “After the storm the only thing left of the helicopter was its wheels. We ended up in Pearl Harbor where we got a new helicopter and some minor repairs to the Missouri. On Sept. 16, 1950 we started bombarding the North Korean coast with our 16 inch main guns. We could fire a projectile the size of a Volkswagen 26 miles. The Missouri concentrated on railroad lines and enemy supply lines,” he said. “The Missouri sailed from the west coast of Korea to the east coast to support Gen. Douglas MacArthur’s Inchon Invasion in September 1950. That’s when he came aboard the battleship and inspected the troops,” Ditto said. “He had his corn cob pipe and was wearing his hat with the moldy scrabbled eggs on the beak. “The general told the Marine captain in charge of our detachment, ‘I’d like to have these troops over on the shore.’ I was standing in the second rank of Marines about four feet from MacArthur. “I remember Christmas 1950 well. The Missouri was at Hungham, along the East Coast of Korea, in support of the 1st Marine Division that was marching back from the Chosin Reservoir,” he said. “We were there with a couple of heavy cruisers, destroyers, some rocket ships and a whole bunch of transports to rescue the 1st Marine Division. We provided fire power to keep the 200,000 Chinese and North Koreans from over-running the 22,000 U.S. Marines on their trip back to the coast. “By January 1951 the Missouri was back in the Sea of Japan supporting our ground troops. We were part of the 7th Fleet. It was there the Missouri was relieved by the Battleship New Jersey. We sailed for home. By then the Missouri had traveled 64,000 miles, fired 3,000 rounds of 16-inch shells and 8,000 rounds of 5-inch shells,” he said. After arriving back in Norfolk the ship took a Midshipmen’s Cruise to England, France and Norway. They took a boat load of Annapolis students to Europe that summer. “As we sailed through the English Channel I remember seeing some of the spars from the ships that had been sunk during World War II that hadn’t been removed from the channel yet,” Ditto said. When he returned to the States, he was transferred off the Missouri after 2 1/2 years and eventually went to Washington, D.C. where he served as a Marine guard at the Navy Department in the Pentagon. Ditto spent 18 months in D.C. guarding the Pentagon and the Marine barracks at Henderson Hall in D.C.
Just before Ditto mustered out of the Corps after four years, he was selected to drive the Jeep that pulled the West Virginia Float in former Gen. Dwight D. Eisenhower’s 1953 Inaugural Parade. There were 47 other Jeep drivers pulling 47 other state floats in that parade. Sgt. Ditto returned home to Berkeley, W. Va. and married Betty, his wife of 56, years. They have two children: Mark and Barbara. The couple owned the Berkeley Auto Parts Store for 30 years until they retired. Now they spend four months each year in Englewood starting in 2000. This story was first published in the Charlotte Sun newspaper, Port Charlotte, Fla. on Monday, March 18, 2013 and is republished with permission. I was winding my watch bright and early Monday morning trying to figure out what I was going to write for a column and in walked Bill Ditto of Englewood. 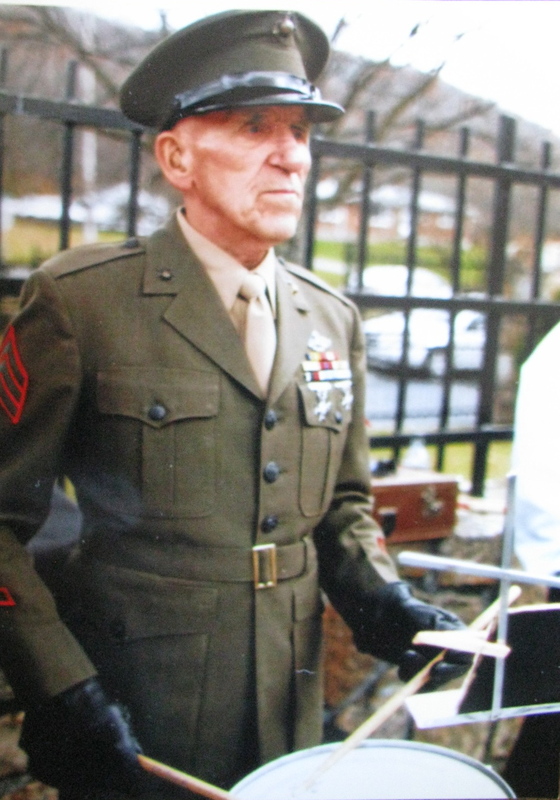 Bill is an ol’ “Jarhead,” a Marine who served in the corps from 1949 to 1953. What makes his time in the service interesting is that he was in former President Dwight D. Eisenhower’s first inaugural parade on Jan. 20, 1953. Since this is Inauguration Day for President Bush, I thought his story might be apropriate. On Inauguration Day, Ditto was a sergeant in the Marines. But more important, he was from West Virginia. The West Virginia delegation was looking for a Marine to drive the Jeep that would pull the West Virginia float in the parade for the president. He fit the bill since he grew up in Berkeley Springs, W. Va., and was serving as a member of the Pentagon’s security forces in Washington, D.C.
Each state was encouraged to build a float that reflected some aspect of Gen. Eisenhower’s life. West Virginia chose the North Atlantic Treaty Organization because the general, then about to officially become president, was involved in forging the military alliance between the United States and NATO. The float was a pretty simple affair. It consisted of a trio of pretty girls and the flags of the various countries constituting NATO in those days. On one side of the silver float was the acronym NATO. There was also a large, round picture of Eisenhower in his Army uniform on that side of the float. On the other side were the flags. There was a curvy beauty on the front of the float and a couple on the back — that was it. In a photo, Ditto can be seen at the wheel of the Jeep towing the West Virginia entry. The crowd along the parade route is 20 deep on both sides of the street in some places. In the background is one float after another. When the affair was finished, a hundred or more Jeep drivers were the guests of honor at a special inauguration party hosted by the Willys Company, which built the Jeep. Shortly after joining the Marine Corps in 1949, Ditto was stationed aboard the Battleship Missouri moored in Norfolk, Va.
“She went on a shakedown cruise to Guantanamo, Cuba, in January 1950 while I was aboard. On the way out of Hampton Rhodes, she ran aground on a mud bank and we were stuck there for two weeks. The captain of the battleship was taken off in two hours after we hit the bank and replaced because he ran her aground. “The Korean War started in June 1950. I sailed with the Missouri over there in September 1950. We stayed there until April 1951,” he said. Ditto got off the Missouri in April 1952 and was reassigned to Camp LeJeune. From there, in 1953, he went to Washington as a Marine guard stationed at Henderson Hall in D.C. That’s when he became a Jeep driver in President Eisenhower’s Inauguration Parade.